Hello, lovelies! 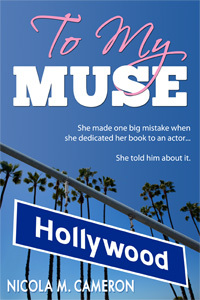 This week I’m teasing you with another snippet from To My Muse. Lily and Tom are busy looking for party clothes when the right dress changes everything for both of them. “Um, Huffington?” I said faintly. “As in…” I waved an index finger around the store. Have you ever met someone who radiated calm and absolute confidence, and simultaneously made you feel like you had been admitted to some utterly cool inner circle? That was Taffy. I suspected she could organize a tea party for the Queen on the fly and wind up with a damehood at the end of it. While Tom took a seat in an area that screamed “upscale man cave,” she showed me to a large changing room with an actual chair, a table, one of those old-fashioned standing screens that had probably been in some Western bordello, and a large three-way mirror. Along the wall opposite the mirror was a small clothing rack that held dresses in an array of luscious colors that were perfect for my skin tone. Clearly Ana had clued Taffy in on my complexion as well as my measurements. Grinning, I skipped out of the changing room and over to where Tom was perusing a copy of Variety. “What do you think?” I said, twirling. “Good.” He leaned down and our mouths met. Remember how I’d said that our kiss yesterday was good, definitely in my top five? This one blew all of them out of the water. It’s next to impossible to describe without going into the purplest of prose, so just imagine finding your soul mate, the people who’s destined to be your other half, and then imagine them kissing you for the first time. Chemistry, desire, delicacy, awareness of the other, a willingness to please, and a simple, perfect happiness–it was all there. I forgot about Nathan, the script, my fibs, everything. All I wanted to do was melt into Tom’s arms and stay there forever. Oops. His hands were on my waist, fingertips gently digging into the fabric. And somehow my arms had gotten around his neck, as well. I may have been clinging to him, I’m not sure. And I’m pretty sure that hadn’t been his wallet pressing into my stomach. Hoo boy. Color spread over his cheekbones as he stepped back, casually tugging his shirt lower. “Er, yes, of course,” he said through an unrepentant grin. Then he winked at me. Posted on February 7, 2018, in Belaurient Publishing, contemporary, Mid Week Tease, Romcom, To My Muse and tagged contemporary romance, Mid Week Tease, nicola cameron, romantic comedy, Romcom, To My Muse. Bookmark the permalink. 11 Comments. Fab snippet again – I’m looking forward to more! Sounds like so much fun! I hope things keep turning for the better. It looks like they can’t keep their hands off each other 😉 Tee hee! Great tease. Love the surprises found in a kiss.